Laura Scheidegger is our Leisure Sales Manager, but more importantly, she is a parent. Her family’s love of snow sports brought them to Sunday River a number of years ago, but having kids and working in the industry can sometimes make it difficult to teach them the skills and make time for family ski days. That’s where weekend seasonal programs, like Mini Runners, River Runners, Junior Professionals, and the Gould Academy Competition Program come in, offering everything from the basics to backflips. 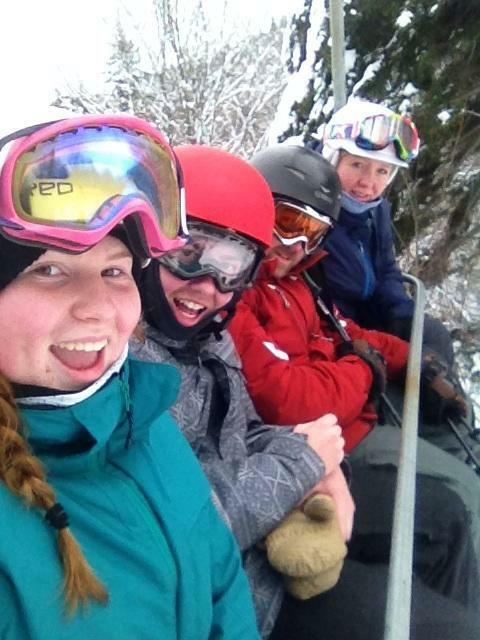 We chatted with Laura about what Sunday River’s seasonal ski and snowboard programs meant to her family. I have two kids: one boy, who is now 21, and a daughter who is 17. Which programs did they participate in and for how long? My son started at age 7. My husband and I moved to Sunday River as skiers, but my son wanted to snowboard. I believe he did three years with the River Runner program before moving to the Gould Academy Competition Program (GACP). My daughter is four years younger, and also started at age 7 in the ski program, where she spent three years. She too moved on to GACP, but after a year, decided she wanted to snowboard. She went back to the River Runners for a year to learn. How did you decide to enroll them in Sunday River’s kids’ seasonal programs? We enrolled my son in River Runners because neither my husband nor I had ever snowboarded. My son had been to a few lessons with the Perfect Turn Ski and Snowboard School prior to entering the program, so he had the basic skill set down. My daughter was enrolled because it was such a positive experience for my son, and she had the basics under her belt. What’s the commitment level for these programs? Were your kids able to be active in other sports too? It’s the kids that make you committed, as they really enjoyed going. My son was committed only to snowboarding, but my daughter liked to belong to every activity—dance, basketball, and more. We were able to let her participate in all of these things. It really worked out. What was your favorite part about the seasonal program as a parent? For me, it was knowing they were with an experienced coach who knew the mountain, and that they were learning and having fun at the same time. What did your kids like most about them? They looked forward to seeing their weekend friends and didn’t have to be concerned about making a new friend each weekend that they came to ride. My daughter’s favorite day was “One Ski Day,” where the coaches allowed them to ski down the hill on only one ski. They loved their coaches, because they were just like big kids. How do you feel this experience shaped them as skiers/snowboarders? River Runners definitely molded my kids to realize that they wanted more. That’s the initial reason for moving into the weekend program with GACP and getting into racing. What are your kids doing now in regards to snow sports? Snowboarding will always be a huge part of my son’s life, and one day he hopes to be able to run a competition program to teach young kids. He continues to compete when possible while he’s in college. My daughter is a senior in high school, and part of the Gould Academy Snowboard Race Team. 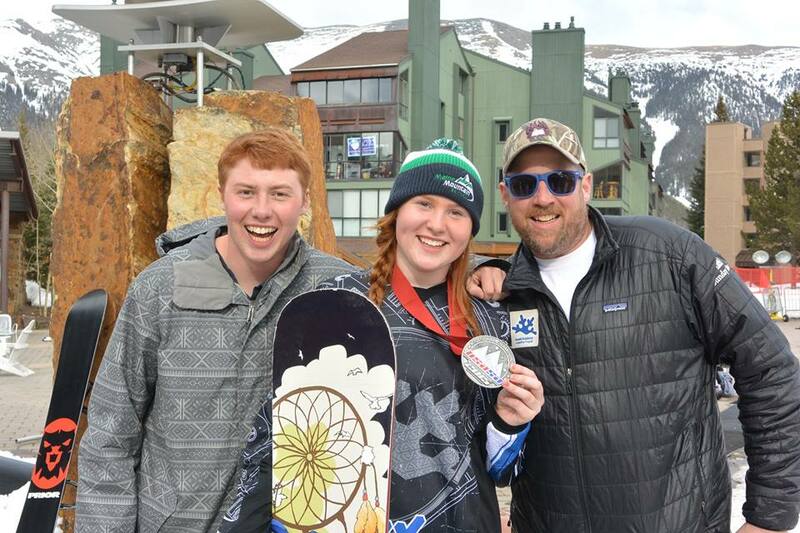 Last year, she received second place for Boarder Cross at Nationals in Copper, Colorado for her age group. She hopes to continue to further her racing career this year and win the gold! What is your advice for parents who are thinking about enrolling their kids but are on the fence? These programs give the kids more than I could have ever hoped for. It not only gives the parents a little freedom to enjoy the mountain, but it allows the kids to gain confidence, learn respect for the mountain and their surroundings, and enjoy what the outdoors has to offer. As parents, we also gained great friends that we met years ago through this program. It’s a win-win. To learn more about Sunday River’s seasonal programs for both kids and adults, visit sundayriver.com/ski-school.